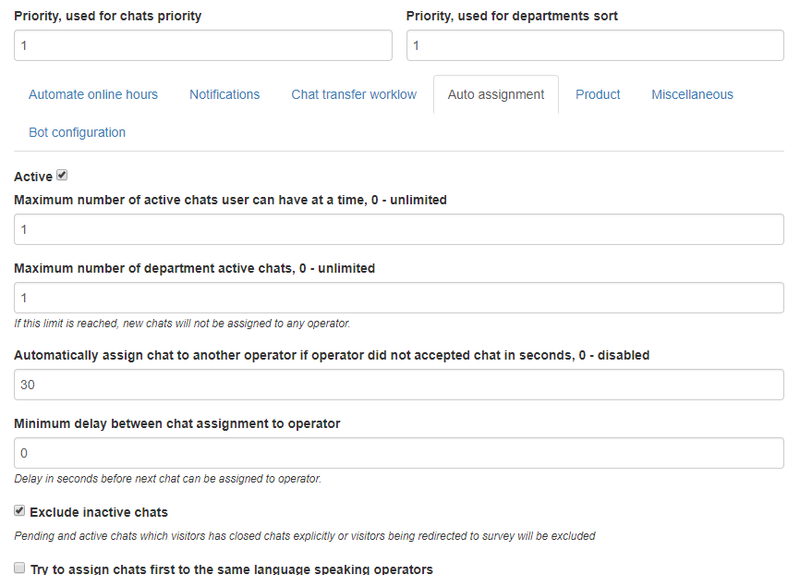 hello if all user of a department have on active chat, can i redirect to another department automatically? Hi, welcome on the live helper chat forum! Maybe if in one department all operators are busy user should leave a message but not change the department. If you need more deep support there are commercial support available, more info on my forum signature. i have this definitions applied but the operator continues to receive the requests. the text in all boxes correct? You have set if the department has 1 chat active and another chat arrive will be refused. Why you set this limit? ( Second field: Maxiumum number of department active chat ) try to leave 0 unlimited. i have two departments, dep1 and dep2, each department have only one user, user1 and user2, respectivaly. The dep1 have prority over dep2, but only can have 1 active chat. All remaining clients when this dep1 is busy are redirected for dep2. and by busy i mean, 1 active chat. Maybe your customized settings create issue.